Place all the ingredients (except for the chicken, wine, and water) in a large bowl and mix well. Add the chicken and toss until the chicken is well coated. Let marinate in refrigerator for 1 hour. Place the chicken in a 9 inch x 13 inch pan or dish. Pour any remaining tomato mixture over the top of the chicken. Add the wine and water to the pan. Loosely cover the pan with aluminum foil and place into the oven. After 30 minutes remove the foil from the pan. Continue to cook until the chicken is firm and juices run clear, about another 15 minutes. Feel free to pep up this dish with more chilli depending on your taste. This will make enough for six portions, so simply freeze the extra if you’re only cooking for four – it’s so good the next day! Sauté vegetables in olive oil for a few minutes. Add soup, water, and about 1 Tbsp chicken base (to start; you can add more later if you need it). Add chicken and bring to a simmer; check seasonings and add more chicken base if you want. You'll use the soup itself to cook the pasta, so add more water if needed (just a little at a time; you don't want it super-thin. Return soup to a simmer, add pasta** and cook about 15 minutes or until pasta is tender. Stir in herbs and serve. *For the chicken base, I recommend Better than Bullion found in the grocery store soup aisle. **If you're going to freeze the soup, just add (separately cooked) pasta to the portions you're serving; the pasta will have a much better texture if you don't freeze it in the soup. Adjust the rack to the bottom of the oven and preheat to 450 degrees F.
Blot any excess moisture from the roast using paper towels. Rub the Worcestershire sauce over the entire roast; allow the roast to sit for a few minutes, turning it several times so that the meat can absorb the Worcestershire. Combine the granulated garlic, onion powder, paprika and coarse-ground pepper in a small bowl; sprinkle the seasoning mixture evenly over the roast, pressing it into the fat and meat just enough to stick. Allow the seasoned roast to stand at room temperature for 20 to 30 minutes before roasting. Rub the roast with the coarse salt and place it fat side up a shallow roasting pan. Roast for 15 minutes, then lower the oven temperature to 325 F. Continue to cook until the internal temperature reaches 5 to 10 degrees below the desired serving temperature, about 2 hours. (Note: Allow about 20 minutes per pound for medium-rare.) When the roast is done, carefully remove the pan from the oven and transfer the roast to a clean cutting board. Allow the roast to stand for 20 minutes before slicing. In a deep skillet, heat 1 1/2 inches of oil over medium heat. In a wide, mixing bowl, combine 2 cups of pancake mix, water and Tabasco sauce. Place 1/2 cup of pancake mix in another wide mixing bowl. Cut chicken into bit size pieces. Line a plate with a few paper towels and keep within reach. Once oil is heated, toss the chicken pieces in the dry pancake mix, shake of excess. Add chicken to batter and toss with a fork. Carefully add the chicken to the hot oil. (You will fry about 3 to 4 batches). Fry the chicken for 2 minutes on each side, flipping once, until deep golden brown. Remove the fried chicken and drain on paper towel line plate. This is one of my favorite stuffings, super easy to make and it goes great with a ham dinner! Mix ingredients well in a mixer. Place in casserole dish and bake at 350 for about an hour. Note: I add a bit of Marinara sauce to the egg and cream mixture because my family doesn't like it too dry. Bring a large pot of water to a boil. Generously add salt and 3 tablespoons of oil and add the spaghetti. Bring back to a boil and cook for 11 to 13 minutes until the spaghetti is just tender. Drain into a colander and rinse under cold water. Return the spaghetti to the pot and set aside. Heat 2 tablespoons of the olive oil in a medium skillet over medium heat for 1 minute. Add the garlic and onion and cook for 3 minutes, stirring occasionally. Add the tomatoes, 1 teaspoon of salt and a few grinds of pepper and cook for an additional 5 minutes until the tomatoes begin to break down. * Remove the mixture from the heat and set aside. Whisk the eggs and cream together in a large mixing bowl. Add the remaining teaspoon of salt, a few grinds of pepper, the red pepper flakes, basil, fontina, feta, 4 ounces of the Parmesan and the tomato mixture. Mix in the spaghetti. Heat the remaining olive oil in the 10-inch skillet over high heat. Add the spaghetti mixture, reduce the heat to medium and cook for 5 minutes. Transfer the skillet to the preheated oven for 30 minutes until the center of the pie is set and the top is golden. Remove from the oven and let cool for 10 minutes. Run a spatula around the edges and underneath the pie to loosen. Place a large plate over the skillet and invert the pie onto the plate. Place another plate onto the pie and invert again. Let the pie set for an additional 10 minutes. Slice the pie into 6 to 8 pieces and garnish with the remaining Parmesan and basil leaves before serving. To make the sauce: Melt the utter in a heavy medium saucepan over medium-low heat. Add the flour and whisk for 3 minutes. Whisk in the milk. Increase the heat to medium-high. Whisk the sauce until it comes to a simmer and is thick and smooth, about 3 minutes. Whisk the salt, pepper, and nutmeg into the béchamel sauce. Whisk the ricotta, spinach, 1 cup Parmesan, egg, salt, and pepper in a medium bowl to blend. Add a tbsp or 2 of oil to a large pot of boiling salted water. Boil the noodles until just tender but still firm to bite. Drain. Arrange the noodles in a single layer on a baking sheet to prevent them from sticking. Butter a 13x9x2 inch glass baking dish. Pour the béchamel sauce over the bottom of the prepared dish. ay out 4 lasagna noodles on a work surface, then spread about 3 tbsp of ricotta mixture evenly over each noodle. Starting at 1 end, roll each noodle like a jelly roll. Lay the lasagna rolls seam side down, without touching, atop the béchamel sauce in the dish. Repeat with the remaining noodles and ricotta mixture. Spoon 1 cup of marinara sauce over the lasagna rolls. Sprinkle the mozzarella and remaining 2 tbsp of Parmesan over the lasagna rolls. Cover tightly with foil. Bake until heated through and the sauce bubble, about 20 minutes. Uncover and bake until the cheese on top becomes golden, about 15 minutes longer. Let stand for 10 minutes. Meanwhile, heat the remaining marinara sauce in a heavy small saucepan over medium heat until hot, and serve alongside. Whisk together the milk, eggs and vanilla. Cut the croissants into halves horizontally. Then dip them into the egg mixture, coating well. Cook the croissants on a large non-stick surface until golden brown, making sure to flip half way through (about 2 minutes on each side). Cut the strawberries into quarters, and add them to a saucepan with the sugar (add the sugar to taste). Cook on low-medium heat until the mixture is a syrup like consistency, and the strawberries are cooked. At this point you can leave the syrup chunky, or puree it. Top the croissant french toast with whipped cream, a little powdered sugar and the strawberry syrup! Delish!! Boil 7 Cups of water, add Boullion cubes. Whisk until the boullion cubes have desolved. Soften the cream cheese by warming in the microwave for about 30 seconds to 1 minutes...wisk into the water. 2. 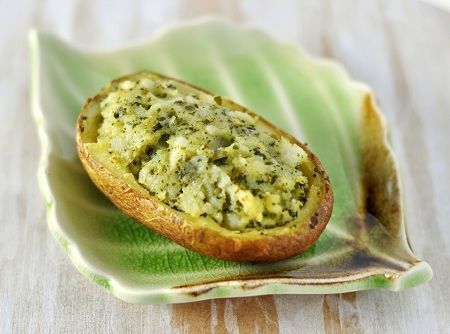 Pierce the potato several times with a fork and then rub a light layer of olive oil over each potato. 3. Bake the potatoes for 50-60 minutes, until fork tender. Remove and allow to cool just enough so you can hold the potato. 4. Cut the top third of the potato off (lengthwise) and set aside (or eat it). Then remove most of the flesh from the potato (leave a bit on each side and the bottom) and place in a bowl. 6. Bake for an additional 15 minutes.